No guesses are needed for what I painted these nails for, right! I've actually seen the movie twice already. Once on a date night in the premium lounge with the hubby, and then again to take my 7 year old son. We all thought The Force Awakens is totally awesome, loved the story, regardless of how similar it may be to A New Hope. I can't wait for the next film in 2017. 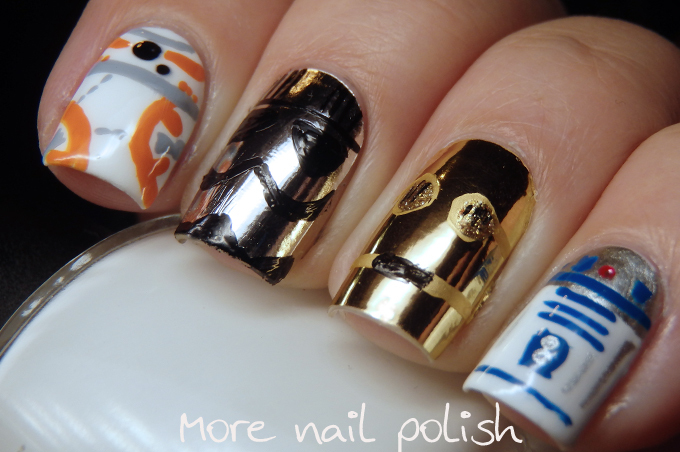 I've done Star Wars nails before, back on May the Fourth, and that time I also did C3PO and R2D2. I had to paint R2 again because his shape is just perfect for nail art. 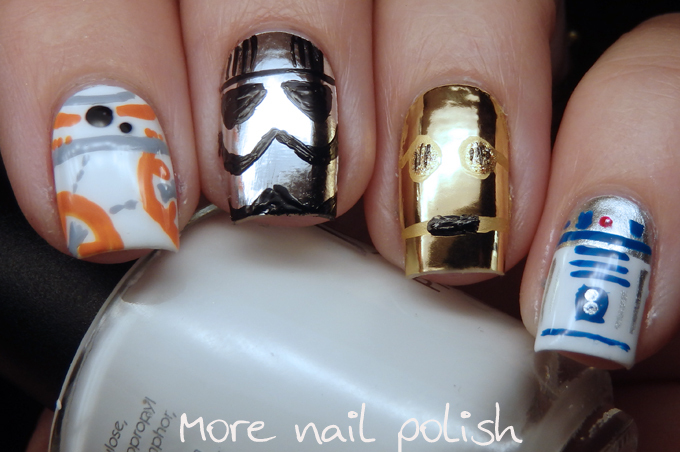 I wasn't going to do C3PO again, until I saw my gold Minx nail wraps, and then I had to do him all metallic and shiny. I really wanted to paint Chewbacca again, and wanted to do Kylo Ren too, because his mask would be perfect for nail art. But in the end I went with a shiny silver Minx nail wrap and created the gorgeous chrome Captian Phasma. On my index finger I painted the oh so cute BB8. I had no idea how to paint BB8, so I took inspiration for Flights of Whimsy, who did a great Droids mani last week. Awsome!!!!! I saw the movie yesterday night with my son and his firlfriend, and I loved it like I did 30-something years ago :). Totally awesome!!!! I ♥ it! Wow, love this to bits! 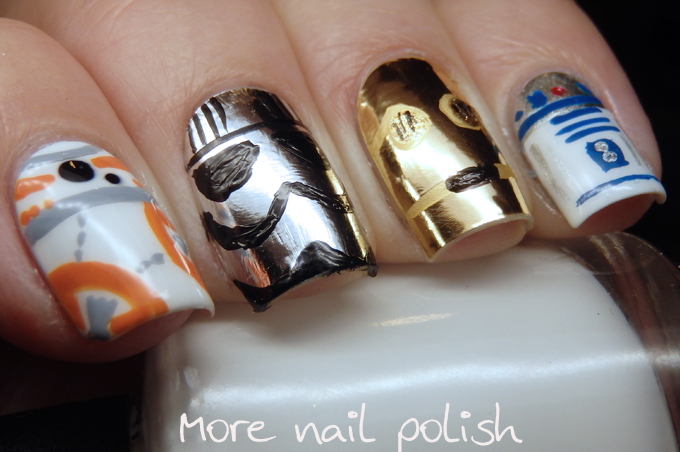 Great Star Wars mani. 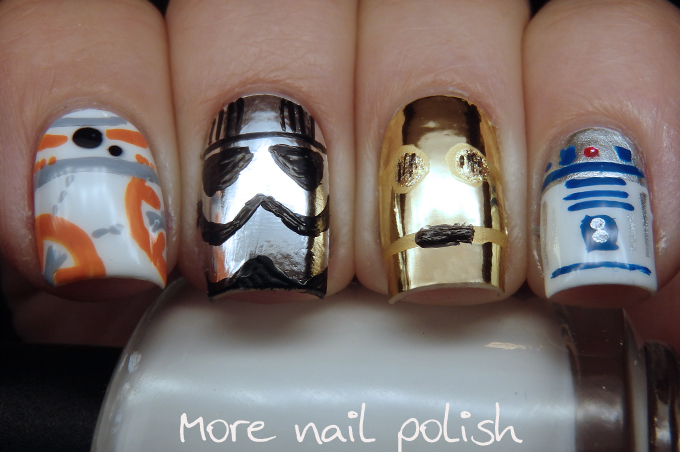 Love how you worked in the minx for ultra shiny c3po! So for kicks and giggles, how much did it cost, I am into acrylics and gelish right now until my nails are all my own then it is all gelish and when next movie comes out, I am doing this, can you post other pics you have done here??? Awesomeness, we got to ever premiere opening with our kids since the new movies got released back at Ep 1, midnight back on East Coast and in Hawaii it's 7PM so we get to see it here early. Neat but my son has huge collection of action figures that dates back to the original trilogy, his collections is worth a fortune!! Anyway, this last movie, we all dressed in matching t-shirts and hats we didn't have light sabers, son won't buy the cheapo Disney ones, wants the REAL thing made on saberforge.com, which the one he wants is $800 and I said Dude, if the settlement that I am due comes in that is #2 #1 is going to Disney and seeing your grampy. Your nails are cutiepatootie!! Share more pics! !